The Enviro Meridian insert fireplace is designed in the American style, with a large bay window which is arched at the top. Featuring Enviro's quiet 160 cfm. convection fan and heavy duty heat exchanger for efficient home heating. At 45,000 btu. this is a powerful heater. This fireplace insert has a cast iron brick effect firebox liner and optional gold, pewter or copper trim detailing. Thermostat and remote control compatible. Large ash pan only needs to be emptied once a week. 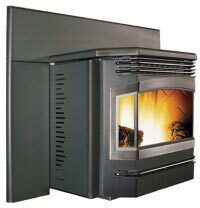 The hopper size can be reduced to fit smaller fireplaces. Convection Blower Capacity 160 cfm. Emissions 1.96 gr. / hr. Small 30 in. by 40 in. Medium 33 in. by 46 in. Rear Vent Height 9.3 in. Pewter, 24kt gold or antique copper body trim pieces. Pewter, 24kt gold or antique copper door cover. The Enviro Meridian insert has a good reputation for reliability. Reducing the hopper size to fit a smaller fireplace will reduce the maximum burn time. Check and clean the exhaust flue every year or after burning two tons of pellets. Clean the glass air wash passages. Vacuum dust from the blowers. If you would like to leave a review of the Enviro Meridian insert fireplace, please use the form on the contact page.